The journey to India is long. The plane trip takes a full day. Flights are typically very crowded. People who are returning home carry as many belongings into the cabin as they possibly can. I have seen people bring televisions, wedding dresses, electronics equipment, and almost anything else that you can think of. A passport and visa are necessary. You can contact the Indian Consulate at any major U S city to get the application. I always log onto the Center for Disease Control website at http://www.cdc.gov/travel/ to find out what vaccinations and other health precautions are advisable. Additionally, the U S State Department carries information about travel advisories for U S citizen's abroad at http://travel.state.gov. There are many global travel agencies that can assist you in making advance preparations for lodging and transportation. Women traveling alone are more vulnerable and often perceived as targets. It is important to be aware of your surroundings and to be responsible for your personal safety. Though I did travel alone for most of the time, I had the benefit of a professional drivers hired from reputable companies. I heard second hand reports of women traveling alone and encountering extreme situations when hiring transportation at the airport. I noticed whenever I was walking with a male companion that I was left completely alone. It was the first time that I ever considered that there might be some instances when I would be better off traveling with companion. 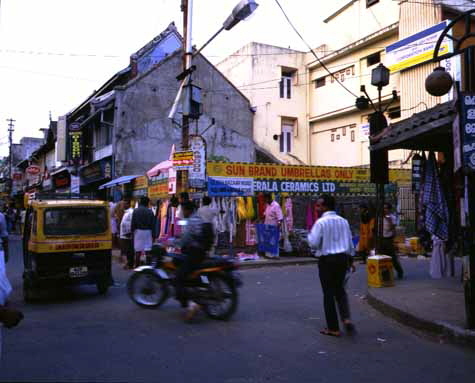 India is a very inexpensive place to visit, once you get there. You can easily spend more on your plane ticket than the cost of the rest of the journey. Hotels catering to local trade can run as little as ten to twenty dollars a night while resort hotels and the grand old colonialist hotels can be one to two hundred dollars per night. Do not however expect an Americanized luxury hotel. Due to the humidity cockroaches are a fact of life. You may find mothballs in the sinks and shower drains to keep the roaches from coming in. Rooms may not be as clean as we are accustomed to. The finer hotels in the larger cities such as Bangalore and Bombay still have that raj/colonialist flair and are truly luxurious. The architecture is massively impressive, dominating the scene and subordinating all inhabitants. I did find these hotels to have exceptional service and easily imagined myself a traveler from days past. The doormen are usually attired in white pants and a Nehru jacket with cloth covered buttons, a red sash and a fez. Dining is a fabulous culinary adventure. Each meal is an opportunity to explore the tastes of the regional cuisine at their source. The cuisine is widely varied by region and excellent. Some of my best meals were spur of the moment decisions to eat at small out of the way places. I will never forget the cheese dosa that I had in Cochin. In a different region just a few days later, I was unable to convince anyone to make a cheese dosa. There are coffee shops in larger towns where tables are crowded with people drinking the fragrant South Indian Coffee. If you've ever traveled to Mexico, then you'll be familiar with the food and drink precautions. Because we have a different bacteria in our water than they do in theirs, our gastrointestinal tract cannot tolerate their water. Bottled water is usually provided by hotels. You can easily buy it but be sure that the seal of the cap has not been opened. Everything is recycled and empty water bottles are refilled with water that is not potable. It is advised to brush your teeth with bottled water, to not eat fruits and vegetables that must be washed and to eat only cooked vegetables. If you are a shopper, you might want to have someone hold onto your wallet because you will be tempted to buy many beautiful treasures. The handcrafts there are incredible from hand coiled pottery used every day, richly dyed fabrics, to 24-karat gold jewelry. There are many fine arts galleries that carry a stunning array of work. These undiscovered artists might be one of the last bargains in the fine arts world. India is a riot of sensory stimulation. If you are willing to let go of fitting her into your expectations, to wander into a world that may be incomprehensible, you may be ready to journey to India.